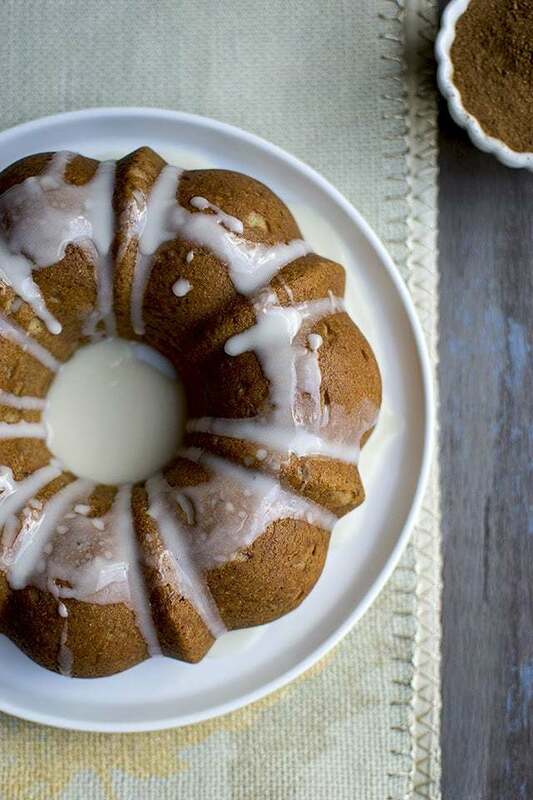 Chai flavored Pound cake made in the bundt pan. It is light, moist and absolutely delicious. Not much into chai spice, then add your favorite spices, like cinnamon, cardamom or pumpkin pie spice to make your own version of the cake. Preheat oven to 350° and lightly grease a 6cup bundt cake pan with cooking spray. In a large mixing bowl, beat the butter, brown sugar and honey until light and fluffy. Add the egg (or egg replacer mixture) and beat until well combined. Stir in the baking powder, baking soda, salt and chai spice. Add half the flour, followed by the sour cream and vanilla and finally the remaining flour. Mix well until just combined, scraping the sides and the bottom of the bowl. Scoop the batter into the prepared pan and bake for 35~40 minutes or until a cake tester or toothpick inserted into the center of the cake comes out clean. Remove cake from the oven and cool in the pan for 15 minutes before turning it out onto a rack to finish cooling. Cool completely before slicing. Make the Glaze: Combine all the glaze ingredients in a small bowl and whisk until well combined. Drizzle over the cooled cake.